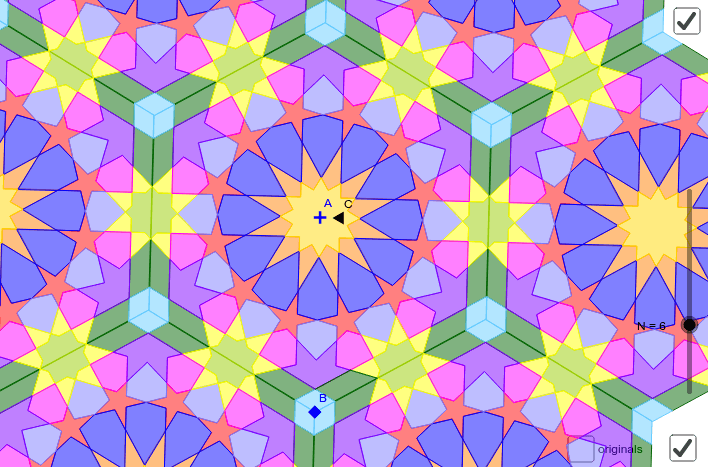 Daniel Ruiz Aguilera tweeted this amazing image that he made in GeoGebra from the Qarawiyyin Mosque in Fez, Morocco. (His sketch.) I was interested in both how this design was made and how it might generalize, so I gave it a go. As near as I can figure, the entire design depends only on the choice of the width of the bands! (Point C in this sketch.) There are so many beautiful structures that combine geometry and artistic choice in this piece that dates back to the 9th century CE. What a masterpiece! More about the mosque and university.